" . . . though the process is a quick and easy one, it’s not for the squeamish. (For one thing, it involves cutting off what amounts to the face.)" The MOST disturbing line I ever read in the NY Times probably involved Dubya in some way or another. Ph.D. Candidate and Supporter of New Orleans Teachers Gail Gleason has submitted a significant comment to a post on World Class New Orleans. Oh, by the way, Ph.D. 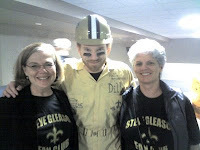 Candidate Gail Gleason also happens to be the mother of Steve Gleason, #37 on the Saints and author of the Greatest Play in Saints' History. I didn't think this was possible . . . I've watched A LOT of "Seinfeld" over the past decade. A lot. Tonight I saw an episode I've never seen before: Episode #6, The Ex-Girlfriend. Well, I didn't think the federal levees would fall apart either. Okay, Where Do We Sign Up to Help Create the Miracle? New Orleans is a much smaller and much poorer city than it was before the storm, and it was a marginal market before the storm. The reality is that unless New Orleans pulls off an absolute miracle and comes back a richer, stronger city than before, the Saints and Hornets will eventually leave. I can't imagine the Hornets being here five years from now. 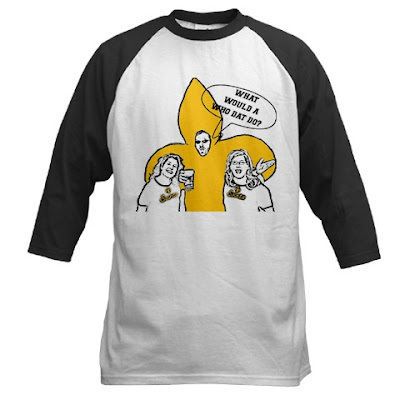 The Saints could last a little longer because the economics of pro football give them more of a cushion, and this is football country. I can't really argue with his clear-eyed perspective on our situation. It will take initiative, creativity, endurance, and tenacity to get us out of this hole. I believe we have what it takes, no thanks to Mayor Curly, President Emptysuit, and others. From Craig, we learn of new evacuation plans for World Class New Orleans. Check his blog for more pix. This time, the order will be, "Beam us up, Scottie Bra." Thanks to the little sis of nopickles.net. Where should we fire the photon torpedoes first? 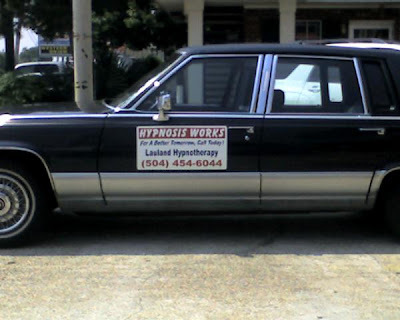 Also, I know where we're deploying the Genesis device: in the wetlands southwest, south, and southeast of New Orleans. One Yard . . . In celebration of the Caretaker admitting that our city was ruined because of the federal levee failure, and in celebration that the 10 percent match rule will be waived (as it was in every other major American catastrophe), I present the link this You Tube classic, which I've watched so many times and still can't stop watching. Deuce. Is. The Man. I'm Not Really One for MySpace, but . . .
Coach Joe (it seems) has his own MySpace here. I am excited about Christmas 2008. But I am more excited about September 6 and 24, 2007. 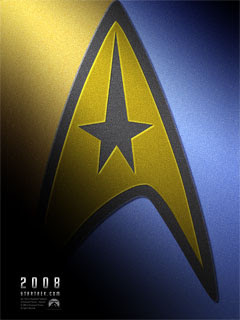 NOTE: I see a lot of black and gold in that Trek logo. Hey, Blake, can you do an insignia like above, except put a fleur de lis inside the design, instead of that star thing-y? That would be way cool. "When the president said he would do what it takes, and stay as long as it takes, he didn't say except if you had wind damage," Kopplin said. Whose side are you on, Caretaker? So THAT'S why I met Efren Ramirez. . . He's filming a movie here. How this for World Class New Orleans? Found on You Tube: a shot-by-shot chronicle of Pistol Pete lighting up the Dome (and the Knicks with Phil Jackson on the floor) for 68 points in 1977. If you're a professional with a truly entrepreneurial spirit--brave, passionate, willing to take risks and try something new--then post federal flood New Orleans is where you should be. I'm glad to see that third parties can see that. We're clearly not at our best right now, and yet we still outrank Chicago, Seattle, San Francisco, Los Angeles, and a lot of other cities. Are we perfect? Of course not. Our flaws are on display for all to see, but as citizens we are well aware of them, and an engaged citizenry--many for the first time--are confronting them. Our educational system is all flux and ferment, an overwhelmingly positive development after years of decline, corruption, and then stasis. Our criminal justice system is responding to the pressure and observation of intelligent critics. Our political system features new players and new alliances. As I've said before, the Times-Picayune's job listings are more fluid, dynamic, and interesting than they have been in years. If you are a TRUE entrepreneur--not an armchair one who wants to land in a dull, faceless suburb on steroids--you need to come join us for the fight and the party of your life. With all of the money and work in our neighborhoods in the coming years, New Orleans will need more contractors and skilled laborers. If you come now and are willing to work hard, you can make a great living. Contrast the prospect of coming to a Top 25 city with being an American contractor in Iraq, where 146 of them were killed in the first three months of this year. You can make history here, or you can be history there. Your choice. National Oceanic and Atmospheric Administration officials are spending $4 million to publicize a 200th anniversary celebration while the agency has cut $700,000 from hurricane research, Bill Proenza said this week at a hurricane conference. Oh, my, but this is awful. Speaking of Jobs . . . I went to a "professional" building in Metairie earlier today. In the lobby, I noticed the directory of offices in the building and came across this very interesting business. I'm really not sure what to make of it, but why do I think this business has some sort of sweetheart contract with President Bush's Department of Homeland Security? 1. I've noticed a lot of homes for sale in the Uptown sliver by the river. Does anybody have any hard numbers? Is there an unusually high proportion of homes for sale now? 2. Check the T-P's Jobs section each Sunday. There seems to be an unusually high number of cool job openings in the "Professional" section, as well as in the other sections too. An exodus deprives _________ of the people who might have rebuilt. #1 and #2 above are based on simple observation, which can be deceptive. Maybe there aren't a lot of homes for sale; maybe there isn't an unusually high number of jobs available in NOLA. But #3, which is really about Iraq, made me think of #1 and #2. Everything I Need to Know . . .
1. I learned from the script of Star Trek II: The Wrath of Khan. 2. Now that we have $2 billion that we would've spent on making German steel people happy, what are we gonna do with that money? 3. Blake links to a really cool baby name thingy. Thus, 19 sites have applied for four slots. New Orleans simply MUST be one of the four. If not, America truly is Ostrich Nation. Also on the list: Hofstra. Thanks to Saintseester, Lee de Fleur is on shirts and other goods. How much is a round-trip Amtrak ticket from New Orleans to Jackson? It Wasn't a Very Long Trip Back to Then . . .
People who dream of a better future are trying, fitfully, to create one, while the government they once thought would protect and serve them slumbers on. New Orleans has been slammed into the 19th century, and it’s going to be a long way back. At Jazz Fest on Sunday, the other Clios and I traipsed over to catch the Iguanas on the Fais Do Do Stage. We've been fans since we were both at the Univ. of Virginia in the early 90s, when New Orleans's "Best New Band" (according to New Orleans magazine at the time) came to Charlottesville and provided a welcomed piece of home by playing at a club there. On Sunday, we were surprised not to see the estimable Derek Huston on stage playing strong and smooth on the saxophone. 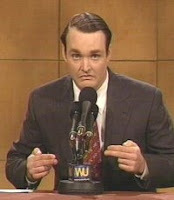 Instead, there was another guy who (nothing against the guy) just didn't have the magic that Mr. Huston has in concert. A reliable source we both know who was in the crowd told us that Derek has been unceremoniously canned after 17 years in the band. We are very disappointed. The Iguanas just got less appealing. Did this picture bother anybody else as much as it bothered me? This ran on the front page of the T-P.
Yuck. 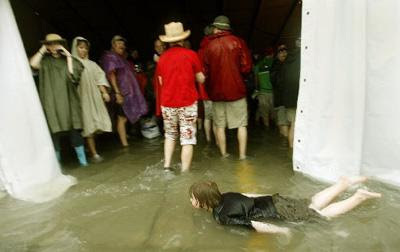 A 9-year-old kid "enjoying" Jazz Fest. Where were his parents? The president's commitment to rebuilding the Gulf Coast remains strong, but so does the need for Louisiana to effectively use the resources it's already been given before appealing again to the already overwhelming generosity of the American taxpayers. I'm sick of this. It literally makes my stomach turn and churn. By the way, I'm glad the president is committed to rebuilding the Gulf Coast. I have no doubt he wants to help his buddy Barbour. However, New Orleans is not on the Gulf Coast--although the president seems committed to making sure that New Orleans ends up on the Gulf Coast. Somehow, posting the Caretaker's picture next to Tim Calhoun, the weird presidential candidate guy from "Saturday Night Live," makes me feel a little better. But not much. Dr. Mrs. Clio gave me some birthday money to spend on upgrading my wardrobe. 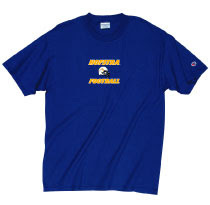 I think she had in mind a suit (which I still plan to do), but I dropped a little money on one of these beauties (and one each for Clio III and Cliette) from the Hofstra online bookstore. Just a note to celebrate Mr. Clio's birthday! It's today! I didn't think Vandals believe in contracts or the rule of law. Through Oyster and my own reading, we learn that Bushism is lazy cronyism.